Preheat to oven 180c / 350f. Grease and line a baking dish with parchment paper. I used a 8in / 20cm square dish. Heat the oil in a frying pan. Add the courgette and broccoli and fry lightly for 3-4 minutes until the vegetables are soft. In a bowl mix the eggs, cheese, flour and herbs together. Add the cooked vegetables and mix until well combined. Pour this mixture into the lined dish and bake in the oven for 15 minutes. 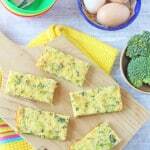 Remove from the oven and allow the frittata to cool before cutting into fingers or squares.